The Southpointe Chamber of Commerce prides itself as being the “Voice of Southpointe and the surrounding business communities”, which includes the fast-growing Racetrack Road corridor. Many chamber members are from Pittsburgh doing business in Southpointe. Also, the Chamber has gone global, with economic and political ties with countries such as China, Japan, and Canada, to name a few. International firms are eager to learn about the energy development in Southpointe and nearby areas. We help you market to businesses in Southpointe including a concentration of companies nearby. Read (and advertise) in more than 35 quarterly magazines, with a circulation of over 20,000 readers (online and in print). 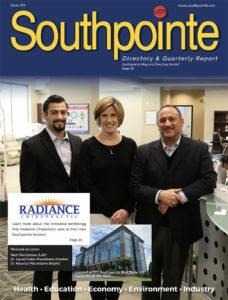 Our magazine, Southpointe Directory and Quarterly Report, an 8 year publication, can be found in businesses all over Southpointe. (Scroll down for copies online) Companies use it as a valuable reference for business locations and events in the community. Our magazine is located in hotel lobbies, restaurants, office conference rooms and more. Membership is only $275 regardless of company size or location. The chamber holds a private corporation status with extensive charitable contributions to non-profit organizations and companies with a worthy cause. We focus on helping startup businesses and new move in businesses to the area. We donate over $50,000 in resources each year with advertising, email promotions, hosted events, products and services. We make no profit on our monthly network luncheon, breakfast workshops or consulting meetings. Our staff and advisory board does not receive a salary. 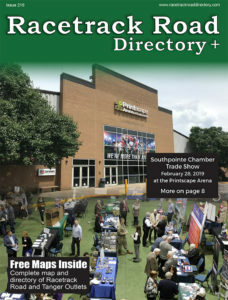 Check out the latest editions of Southpointe Directory and Quarterly Report and the Racetrack Road Directory. You can pickup a printed copy at our office or drive-in directory center at each entrance. Southpointe is a suburban business park located in Washington County, Cecil Township, near Canonsburg, Pennsylvania, 17 miles South of Pittsburgh. It is home to over 300 businesses and many corporations, including including CONSOL Energy, Ansys software, Range Resources, EQT, Halliburton, and Mylan Labs. Since the development of the Marcellus Shale energy program in the Appalachian region, Southpointe has become home for many of the largest natural gas producers, including EQT, Range Resources, Consol Energy, DPS Property, Chesapeake Energy, Columbia Gas. Southpointe is a high technology park as well. Additional specialty service companies related to the telecom/engineering industry are Southpointe Telecom, Ansys, Crown Castle, Ness Corporation, Mylan Labs and many more. You are invited to attend our events. (Click on "EVENT" above) and meet the many business leaders in the community. Over 300 companies and 9,000 employees.